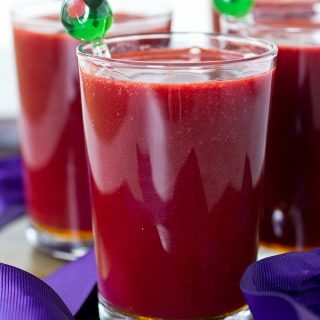 Today, I have a little something different for you: I created three different mocktails that you can either make for yourself, or create a make-your-own bar for your next party, and they all require only three ingredients (and of course, you can also feel free to make them into cocktails!). 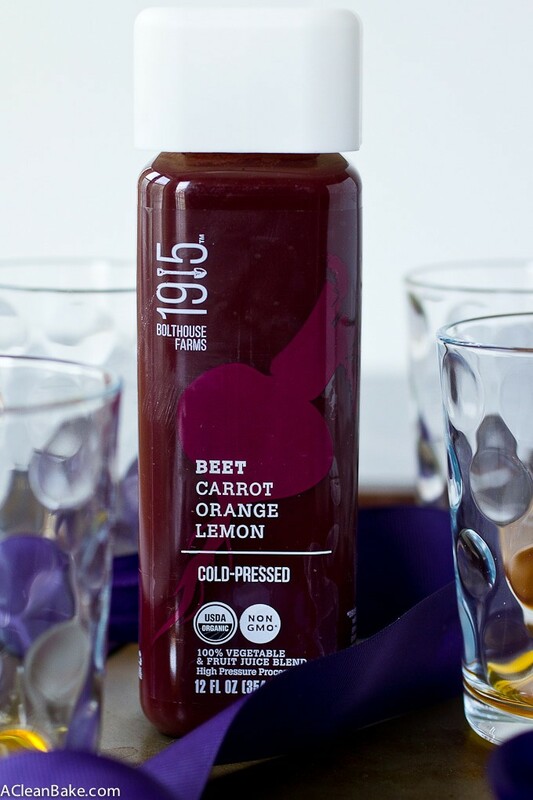 All three of these drinks have one thing in common, and that’s a base of cold-pressed juice. Cold-pressed juice is my hydration of choice this summer (ok, and every summer) because it’s refreshing, nutritious and SO GOOD. Whenever I’m out and about and need a pick me up, I maniacally seek out a fresh juice. And since I prefer a juice that mixes fruit and vegetables, I can justify the price and the hassle of finding them by reminding myself of all the bonus nutrition juices contain. It’s like eating an extra salad (… in my mind, anyway). 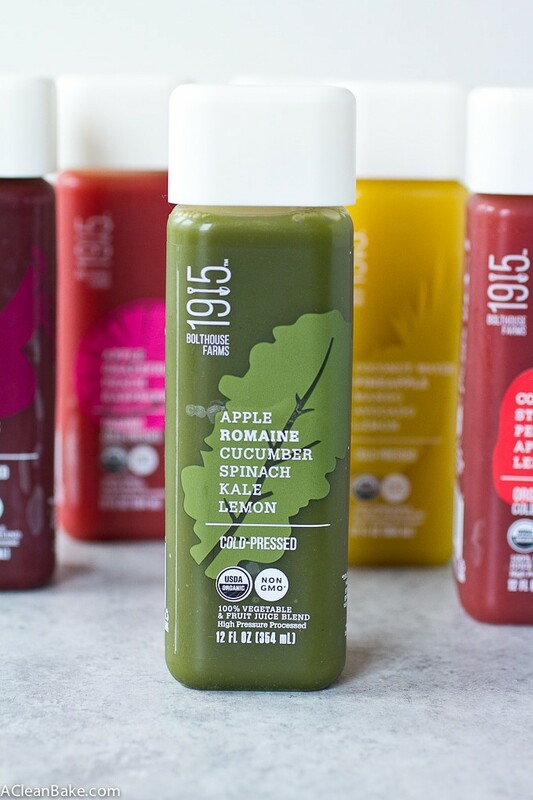 These recipes call for 1915 Bolthouse Farms™, my new favorite line of bottled juices, which are easier to find and much more affordable than the stuff I usually seek out from juice shops, but they still pack the same caliber of flavor and nutrition. 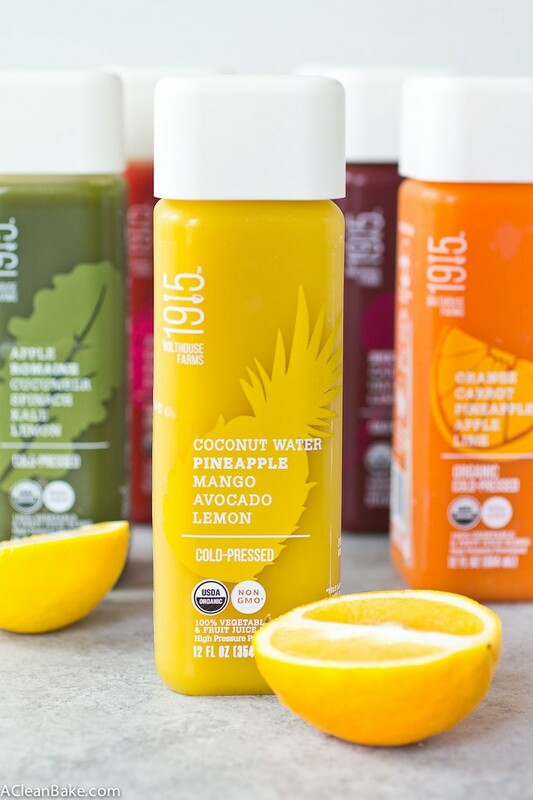 1915 is an organic, ultra-premium line of beverages that includes 8 cold-pressed fruit and vegetable juice blends and 3 protein smoothies. Everything from 1915 is organic and non-GMO – which, I know, I know, I am such a yuppie, but totally sold me. 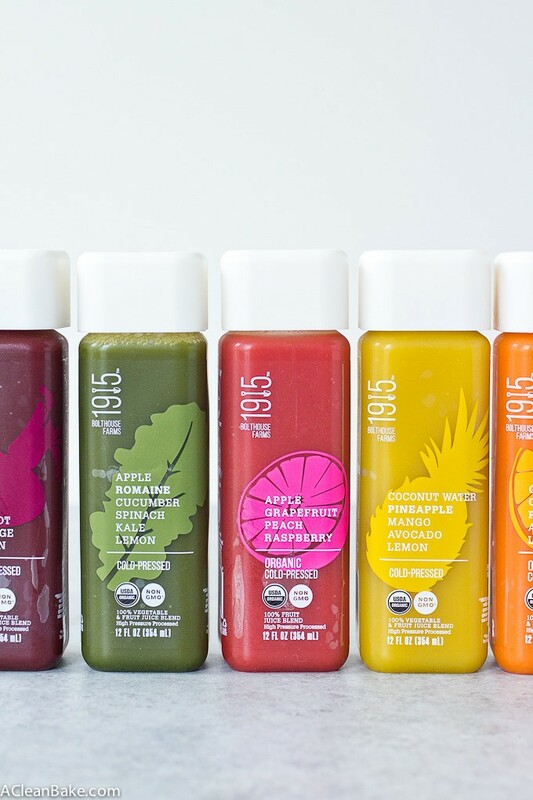 Better yet, you don’t have to hunt down a juice shop in some high-rent neighborhood; you can get 1915 juices (and smoothies) at normal stores like Walmart, Kroger and Safeway. And the price tag? Only $3.99 a bottle. I’m not even going to tell you what I’ve been paying at those juice shops. 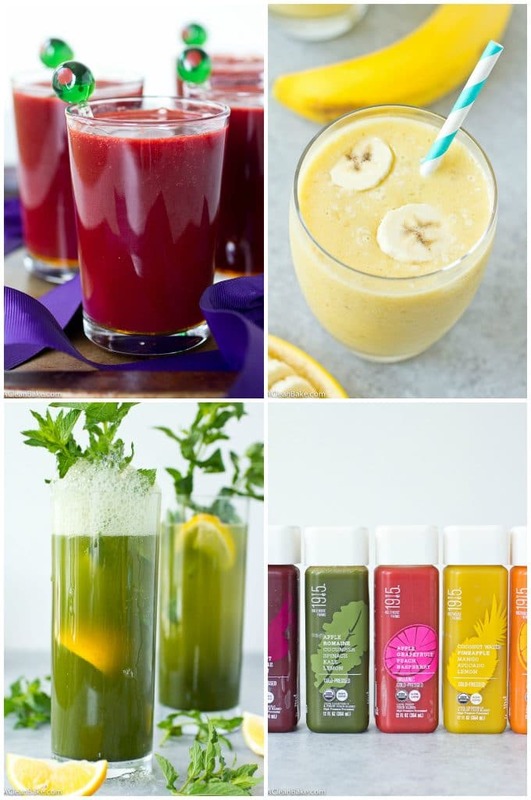 I’m making it even easier for you to swap in these healthier beverages for whatever you’ve been drinking this summer: if you scroll down to the recipe section of this post, you’ll also see a giveaway where you can enter to win a box of 1915 Bolthouse Farms beverages ($40 ARV)! So, as I said, I have three (!) mocktails for you today. The first one uses 1915 Beet/Carrot/Orange/Lemon juice. Since it is such a lovely shade of plum, and I love alliteration, I call it the Purple Probiotic. You can just call it “something I want to drink” if that’s easier. For this drink, all you need is the juice, kombucha and honey. Pour 1 Tablespoon honey into each of two tall cocktail glasses. Divide the 1915 juice between the two glasses and stir vigorously to incorporate the honey into the juice. Sub agave or maple syrup for honey if vegan. Next up, I have a heartier frozen mocktail for you. 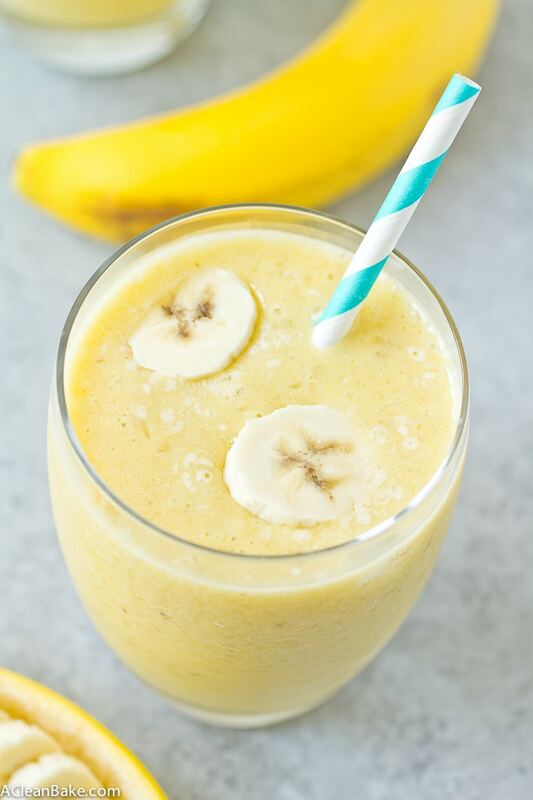 Imagine a pina colada, but minus the coconut and rum, and plus a shot of protein. Told ya I “healthied” these up! 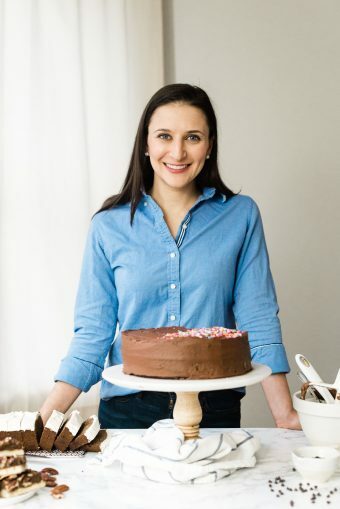 Combine all ingredients in a high speed blender. Puree until smooth. 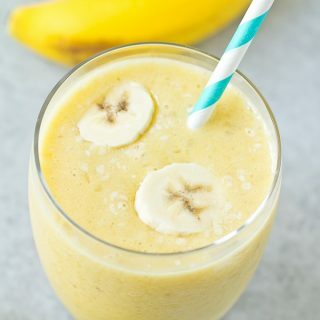 Divide into two glasses, garnish with extra banana slices (optional), and enjoy immediately. 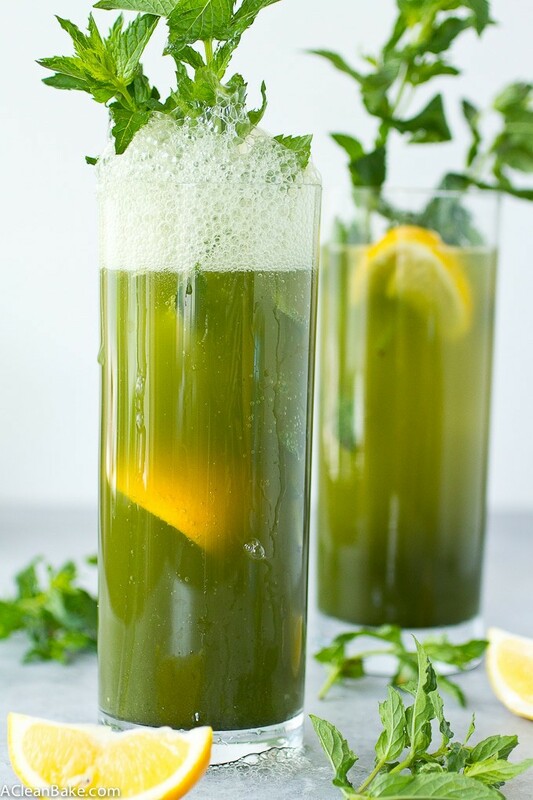 Last but certainly not least (this one is my personal favorite), I made a sparkling green juice. Green juices are my favorite, both for the sweet-tart flavor combination and the salad-in-a-bottle appeal. Add some extra zing using milder Meyer lemons, and some sparkle and all of a sudden a salad in a bottle turns into a special occasion beverage! 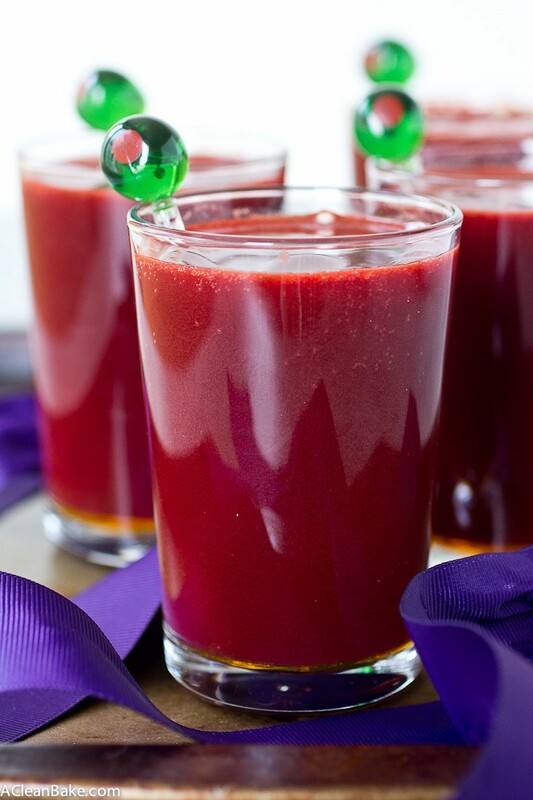 gluten free, grain free, paleo-friendly, vegan, dairy free, egg free, low carb Purple Probiotic Mocktail uses fresh fruit and vegetable juices for a nutritious boost and kombucha for extra probiotics (for gut health!). GF and vegan. 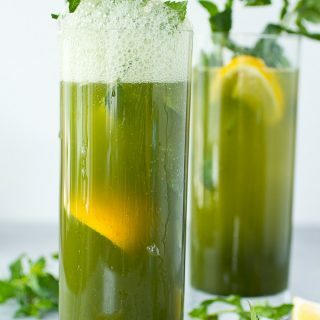 Divide the 1915 green juice between two large cocktail glasses. Stir 3/4 Tablespoon lemon juice into each glass. Top each glass with 6 ounces seltzer. So, there you have it: three drinks, three ingredients each, infinite satisfaction! Catch? No catch. It’s 90 degrees out so I think we all deserve a 1-minute, 3-ingredient beverage to cool off with. And if you can sneak in some extra goodness for your body – in the form of nutrient dense 1915 juices – then… well, what are you waiting for? Happy sipping! Please note that the giveaway runs from July 1 to July 30, 2016. Bolthouse Farms will contact the winner directly, and in order to qualify you must be 18 or older and a US resident. Only one winner is allowed per household. Good luck! These looks so refreshing and perfect for summer! All of these mocktails look sooooo refreshing! I could seriously use some nutrient infusion after the long weekend, and all of these look like they’d definitely bring me back to life. Bravo!